Failure isn't always avoidable. And even when it is, the lessons it can teach us can be more rewarding than the benefits that come with success. To reach these benefits, you need to approach failure with the right frame of mind. Failure is a blessing. Most people don't view it this way, of course. That's why so many people avoid failure like the plague. They do whatever they can to ensure it's not an option. But failure isn't always avoidable. And even when it is, the lessons it can teach us can be more rewarding than the benefits that come with success. 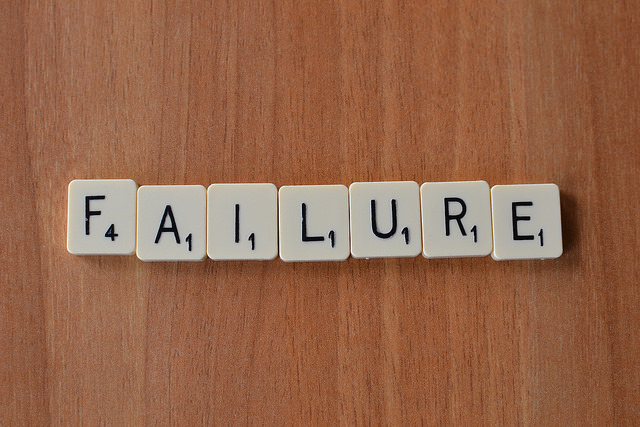 To reach these benefits, you need to approach failure with the right frame of mind. I spent much of my life with the wrong idea about failure. Many things came easy to me. And because I had so many early successes, experiencing failure later in life caused deep wounds. But when I recovered from the meltdowns from not getting my way, I was able to see the priceless gifts failure gave me. If you're open to it, you can discover these gifts too. Getting denied something you desire rarely feels good. And because success is never guaranteed, you have to decide if you're willing to face more rejection in your quest to reach your goal. It took James Dyson 15 years and 5,127 prototypes to finally launch his first vacuum. It would have been understandable if he quit after prototype 239 didn't work. But his desire caused him to persevere. And now he runs a multi-billion dollar vacuum company. If you don't have a strong yearning for the prize you are seeking, eventually you'll cut your losses and move on to something else. Failure forces you to have moments of truth with yourself. It's easy to attach your self-worth to external indicators such as your bank account, your job title, or who loves you. When those things aren't exactly where you want them to be, it can throw you into a tail-spin. But after enough failures and subsequent self-loathing sessions, you'll realize a beautiful thing: Closed doors don't define you. Your worth is not dependent upon whether you placed first, if your last business failed, or if someone picked you. Your value is in intangible traits like your character, your spirit, and how you treat others. Failure will teach you that when the world tells you no, you are still enough. When you have a history of things going your way, it's easy to take it for granted. Instead of preparing as best you can, and pushing yourself to improve, it's easy to fall back on your innate talent. It's easy to get complacent and focus on your past record of success as an indicator for what's to come. "Achievement is talent plus preparation. The problem with this view is that the closer psychologists look at the careers of the gifted, the smaller the role innate talent seems to play and the bigger the role preparation seems to play." Your talent may have gotten you to the top in the past, but it won't keep you there. Failure will remind you that your talent isn't enough. You've got to put the work in to present your best self in reaching for your goals. Every time you fail, you get new data. You get information about what doesn't work. And as you work to improve upon your efforts in future iterations, you learn new skills. As you try new approaches, you strengthen your arsenal. Your thinking, your frame of reference, and even your creativity expand as you move closer to figuring out how to get the results you're looking for. Failure gives you a hunger to search for a solution that works. The possibility of failure defers many dreams. Thoughts such as, "What if I look stupid?" "What if I fall on my face?" or "What if they say no?" keep far too many people on the sidelines. But when you experience rejection enough times, you realize that a "no" isn't the end of the world. And if you embrace the other gifts that failure gives you, you'll be able to use them as fuel to push past other "what ifs." You can use those experiences to propel you to put yourself out there and give yourself the chances you need to succeed. Failure will toughen you up. If you learn the lessons failure teaches you, it can be a wonderful gift that enriches your life. Besides, it gives you a much better story to tell once you do reach your goal.